An American flag is displayed with Chinese flags on top of a trishaw in Beijing. U.S. President Donald Trump escalated his trade war with China on Monday, imposing 10 per cent tariffs on about $200-billion worth of Chinese imports, but sparing smart watches from Apple and Fitbit and other consumer products such as bicycle helmets and baby car seats. The iPhone was not among the ‘wide range’ of products that Apple told regulators would be hit by the $200-billion round of tariffs in a Sept. 5 comment letter to trade officials. But if the Trump administration enacts a further round of tariffs on $267-billion in goods, engulfing all remaining U.S. imports from China, the iPhone and its competitors would not likely be spared. Collection of tariffs on the long-anticipated list will start Sept. 24 but the rate will increase to 25 per cent by the end of 2018, allowing U.S. companies some time to adjust their supply chains to alternate countries, a senior administration official said. 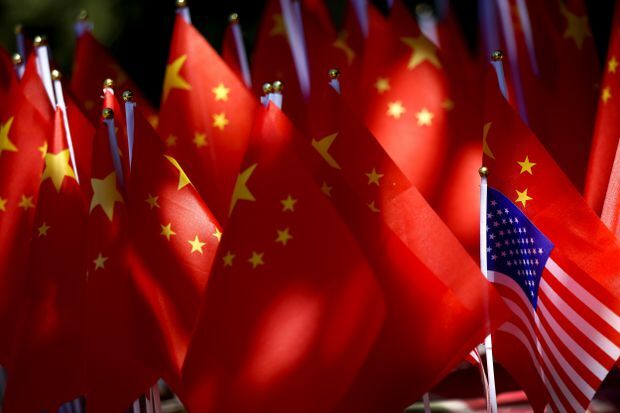 So far, the United States has imposed tariffs on $50-billion worth of Chinese products to pressure China to make sweeping changes to its trade, technology transfer and high-tech industrial subsidy policies. Beijing has retaliated. Fang Xinghai, vice chairman of China’s securities regulator, told a forum in the Chinese port city of Tianjin on Tuesday that he hopes the two sides can sit down and talk, but added that the latest U.S. move has “poisoned” the atmosphere for negotiations. China’s yuan currency slipped 0.3 per cent against the U.S. dollar in Asian trade on Tuesday. It has weakened by about 6.0 per cent since mid-June, offsetting the 10 per cent tariff rate by a considerable margin. A broad, $23-billion category of internet-connected devices will remain subject to tariffs, but some products, such as smart watches, Bluetooth devices, and other consumer-focused technology products were removed following a lengthy public vetting period during which more than 6,000 comments were received. “President Trump’s decision to impose an additional $200-billion is reckless and will create lasting harm to communities across the country,” said Dean Garfield, president of the Information Technology Industry Council, which represents major tech firms. The Retail Industry Leaders Association pointed out that the new tariffs would still hit more than $1-billion worth of gas grills from China, $843-million worth of luggage and travel bags, $825-million worth of mattresses, and $1.9-billion worth of vacuum cleaners.